I struggle with making my own pastries. It’s so much easier to just buy a pre-made pastry, but I’m one of those people who gets weirded out by any product whose ingredients include things I wouldn’t add if I were making it myself. For example, “distilled monoglycerides” and “soybean oils colored with beta carotene” would never make it into my homemade pastry crust, but they are ingredients in Pepperidge Farm’s frozen puff pastry sheets. Just yuck. So I’ve been on a little journey to learn to make a decent pastry. The added bonus, of course, is that after I make the pastry, I get to use it in a recipe! Here’s one of my favorites so far: an easy pastry crust with simple toppings that makes a great little French lunch tart. Inspired by Laura Calder. First, the pastry crust. 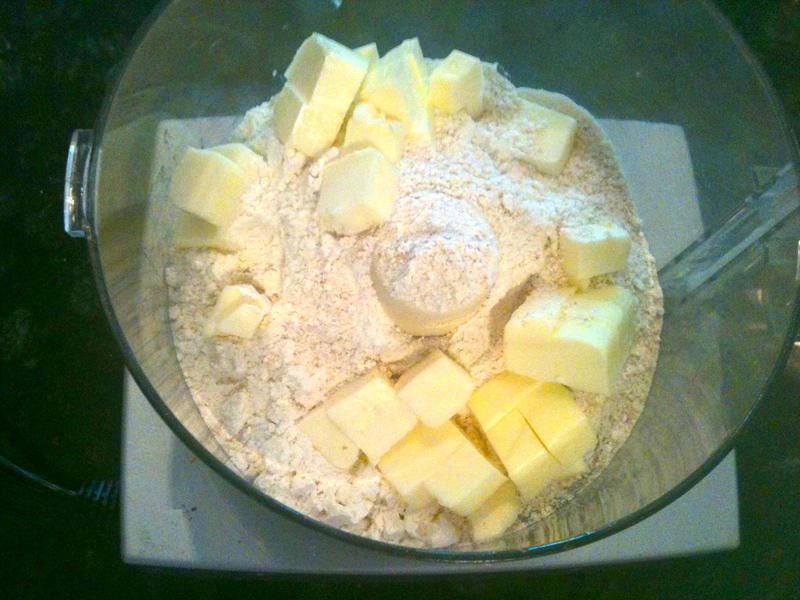 In a food processor, blitz flours and butter until well-combined. 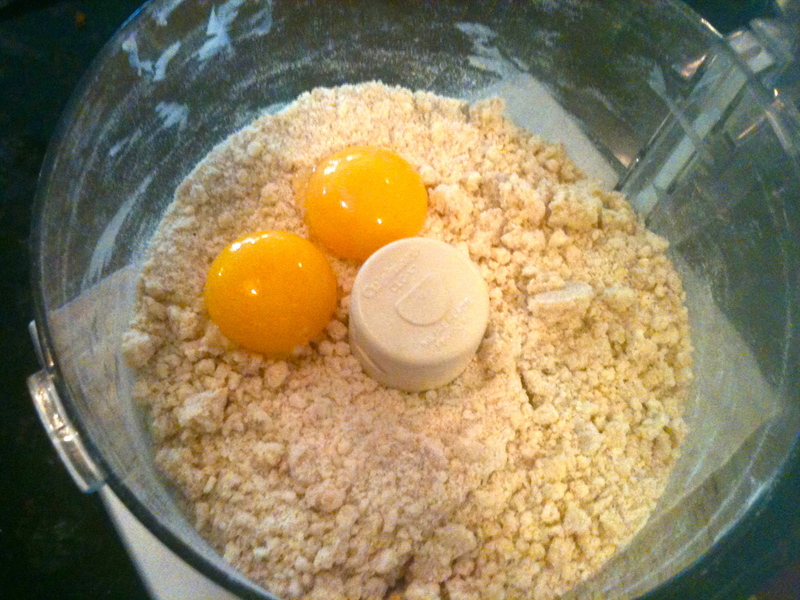 Then add egg yolks, salt, and a small splash of water to help it hold together, and pulse lightly until just combined. Turn out onto wax paper, mold into a ball, wrap tightly in paper, and refrigerate for 30 minutes. 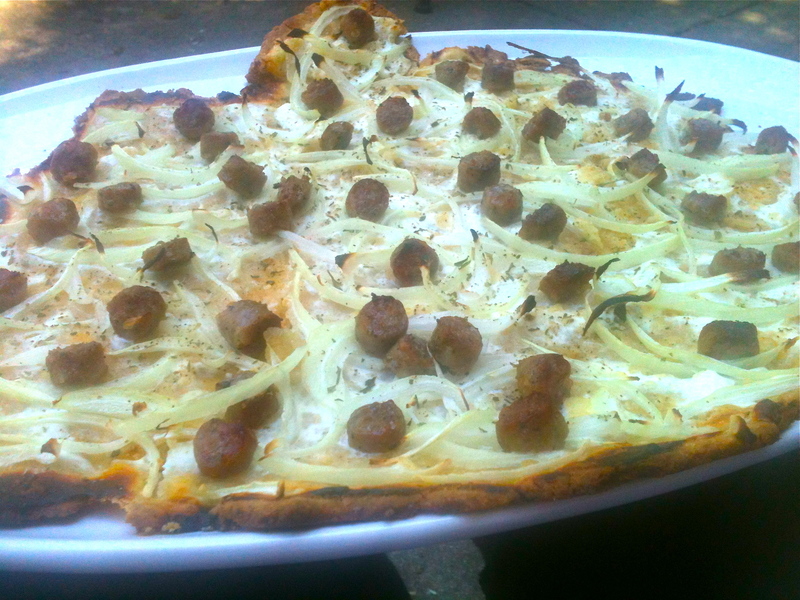 Preheat oven to 450 F. Remove chilled dough from fridge and let it warm up for about 5 minutes. On a floured surface, roll it out into a sort of free-form oval shape. Now it gets a bit tricky: carefully transfer to a baking sheet. It’s okay if it falls apart a little bit; I always have to put it back together a bit once it’s onto the pan. No need to be fancy! Just let it be. 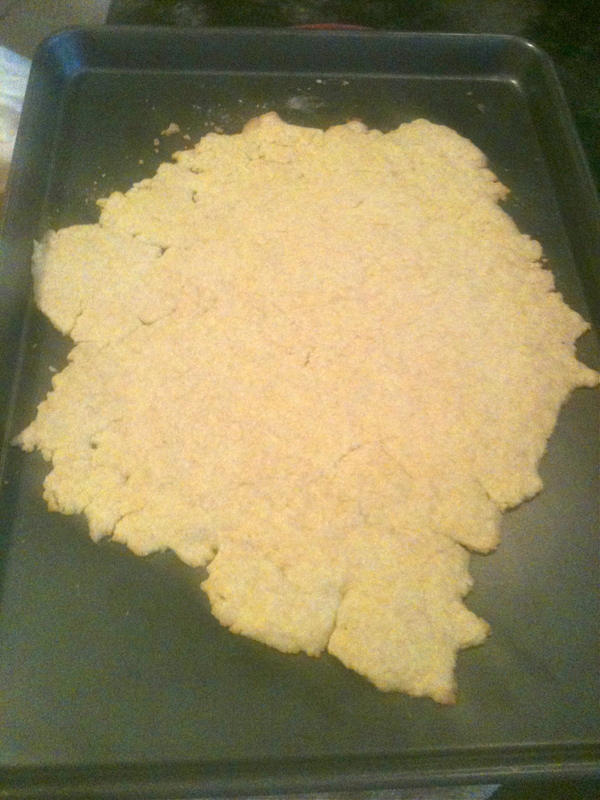 Par-bake your pastry crust for about 5 minutes, until the edges start to brown. Then remove from oven. Let the crust cool for 5 minutes. Scoop the yogurt or sour cream onto the crust and carefully spread it out, right to the edges. I like to use my fingers to do this because the crust is so tender, it can fall apart easily. 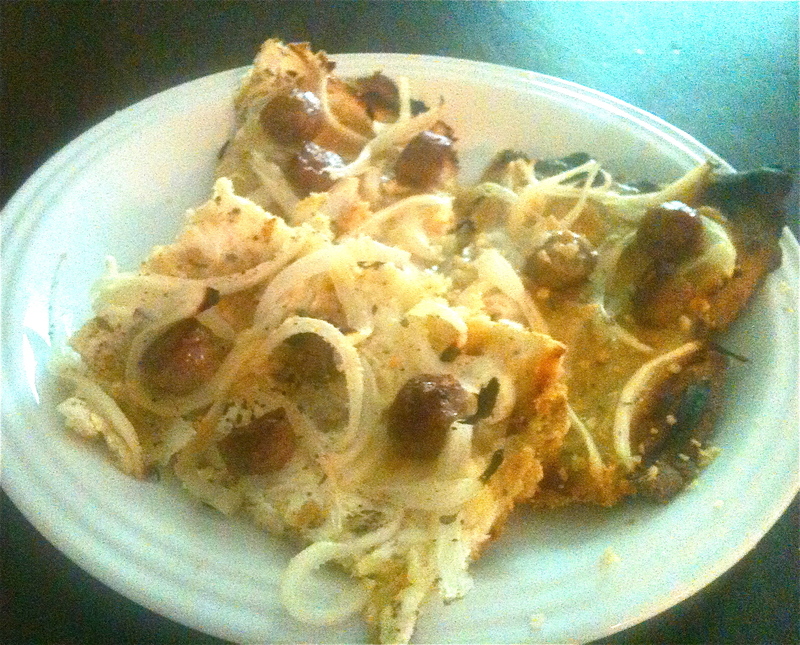 Then strew the onions, sausage, and seasonings over the crust and put it back in the oven for 15-20 minutes, until onions are browning at the edges and sausage is cooked. Let is cool a bit before serving and enjoy!